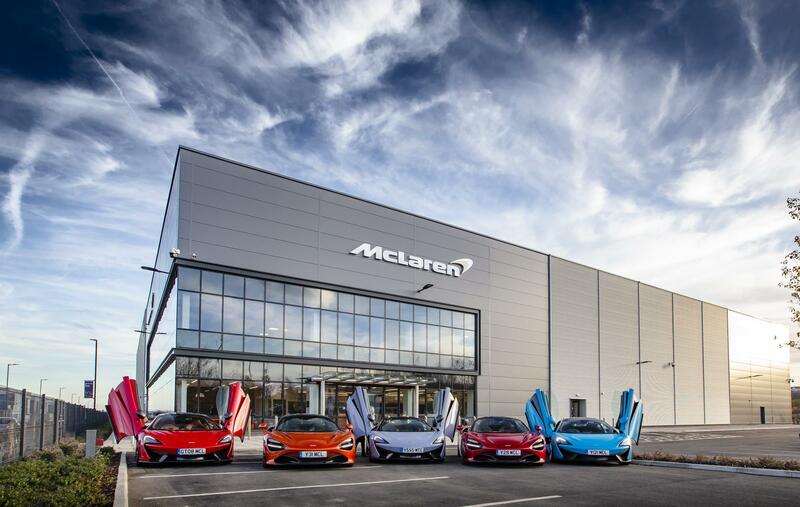 TRH The Duke and Duchess of Cambridge and HRH Prince Salman bin Hamad Al Khalifa, the Crown Prince of the Kingdom of Bahrain, have officially opened McLaren Automotive’s new £50m production facility in Yorkshire, England. The McLaren Composites Technology Centre (MCTC) aims to be a world-leader in innovating lightweight carbon fibre and composites that will work together with future powertrain development to save weight and produce greater energy efficiencies. Prototyping has already begun on innovating McLaren’s next generation of lightweight carbon fibre tubs that are integral to the agility and performance of its sportscars and supercars. Those present to witness the occasion were invited representatives from Sheffield and Rotherham Councils, senior local stakeholders and the 50 employees already employed at the MCTC. First announced in February 2017, construction commenced just five months later and following six months of fit-out, the MCTC is now the company’s first purpose-built facility outside of the current McLaren campus in Surrey. McLaren’s ability to tap into the Sheffield region’s extensive materials expertise, skills, university resources, and dynamism will help it to continue to innovate quickly and launch 18 new models or derivatives under its ambitious Track25 business plan that are lightest in class. The in-sourcing of the manufacture of the carbon fibre chassis also increases the average percentage (by value) of a McLaren car sourced in the UK by around 8% from its current average of around 50%, depending on model. Carbon fibre has long been a part of McLaren’s DNA, the company having introduced the very first carbon fibre chassis into Formula 1 in 1981. Carbon fibre’s innate strength and lightweight properties mean that the company has never made a race car, sportscar or supercar without it since. After completing trial tubs in 2019 and once fully operational in 2020, the MCTC will create over 200 direct jobs and produce carbon fibre tubs that will be sent to the McLaren Production Centre (MPC) in Woking, Surrey, for hand assembly into cars, over 90% of which are then exported to markets worldwide. After seeing an example of a completed carbon tub, Mike Flewitt, McLaren shareholders and senior members of the company’s executive toured the Royal guests around the facility. The target is that the MCTC will deliver £100m of gross value-added benefit to the local economy by 2028 as well as supporting skills development in the region.